It was bedtime, and I heard Hyrum's voice from his room. "Mom, will you put this away for me?" This is not an unusual request around here, as you can imagine. The object Hyrum snuggled under his chin also was not unusual. I looked down at my still little nine-year-old son. "Where do you want me to put your blanket, Buddy? Does it need to be washed or something?" His chocolate eyes were somber and holding back tears. "Mom, I need you to put my blanket away somewhere before it gets totally ruined." My mom makes each of her grandkids special quilts when they are born and when they are baptized. The blanket he gently extended to me was his baby quilt--the one that's been on his bed since he was a baby. The one with the red stop signs in the border and the plaid trucks in each block. The one he's taken on every road trip we've ever been on--that blanket has been coast to coast, north to south, covering my growing boy's body as long as he's been alive. It's frayed in many places now, with the stuffing poking through the worn spots on the edges and where the trucks have torn away. It broke my heart to see the pain in his face as he voluntarily parted with his beloved. I tried to change his mind. "Are you sure? I mean, we could just put it somewhere in your room for when you need it." That's when one tear escaped. "No, Mom. I don't want it to be ruined." He shoved it into my hands and quickly went into his room. I was surprised at his vision in that moment. Instead of loving it until it completely disintegrates, he needs me to save it for him. How could my little Hyrum be so wise? I followed him into his room, still holding his treasure. "I have a good idea. Why don't I wash it tonight and then I'll put it somewhere safe tomorrow? Or do you want to snuggle with it one last night?" My heart ached to see his pain. "No." He turned and looked at the wall to hide his tears. I tenderly turned his face and wiped away his tears. Moms are lucky that way--one of my most treasured jobs is wiping away tears. "Rum. Grandma made your baptism quilt so that it would be almost the same as your baby quilt. Maybe you can start snuggling up with that one?" While the baptism quilt has been in his room for almost two years now, his loyalty has never made the transfer from the smaller quilt. I pulled the big, almost new quilt out of the pile of unmade bedclothes and pointed out some of the similarities. He took it from my hand and wrapped himself in its warmth, but I could see it just wasn't the same. After putting the baby quilt in the wash on the delicate cycle (it is that frayed and that fragile), I returned to my frantic search for a missing notebook. Before the wash cycle even completed, Hyrum was back in my room, doubting his decision already "Mom, have you washed my blanket yet?" When I told him it was still wet in the washer, he good naturedly returned to his bed and his not-new-but-unfamiliar quilt. He was long asleep by the time I turned on the dryer. I had already removed his blanket from the dryer this morning, folding it and placing it on my window seat before deciding where I should store such a precious childhood memory. Hyrum appeared in the early morning light, shirtless and wrapped in his baptism quilt. "Mom, where is my blanket? Is it dry?" I directed him to my window, and even in the very pale light, he recognized his friend. 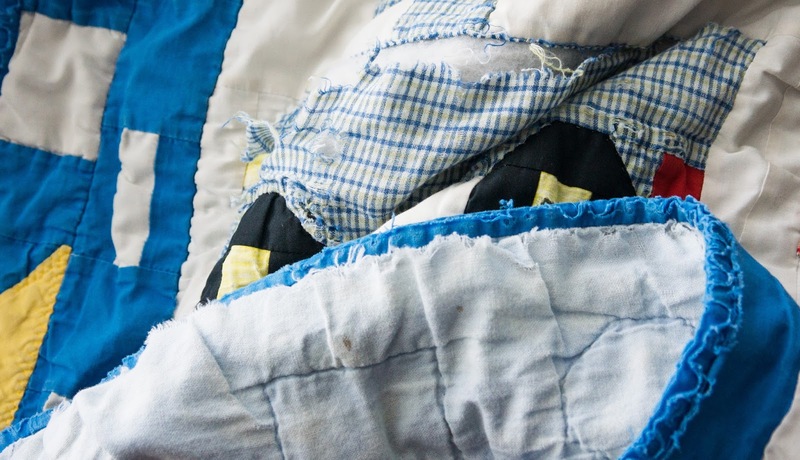 Dropping the big quilt to the floor, he ran to the tattered blanket, and snuggled it close to his bare chest. "Just one more snuggle before you put it away. Ok?" I sat next to him and drew his small head close to me. Much more quickly than I thought, he handed me back his treasure without a backward glance, snatched up the big quilt from the floor, wrapped himself snugly inside, and wandered off down the hall.